Applications integrated with OCS to leverage the power of presence is really good news for everyone. 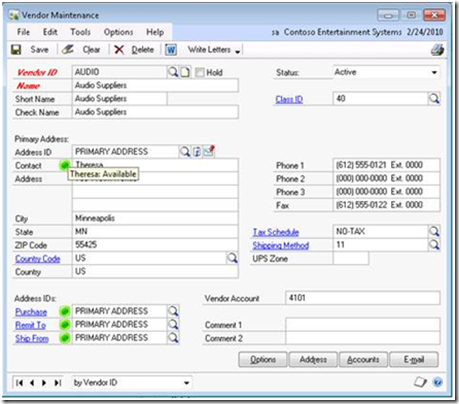 Customers using Dynamics GP 2010 can see the presence of contacts within the product. Obviously it requires Federation to enable cross business presence but this is a great driver to bring even more emphasis on B2B unified communications. This entry was posted on Saturday, May 1st, 2010 at 10:45 and is filed under OCS 2007 R2. You can follow any responses to this entry through the RSS 2.0 feed. You can leave a response, or trackback from your own site.